It was sunny on Sunday and warm to boot. So when David and Ashley showed up for a visit, Will asked him to help him band the bull calves. (It sure is easier when they weigh 100 pounds or less, rather than 300 pounds!) They gathered up the elastrator and headed for the training ring. Will and David are banding Midnight, our youngest bull calf. They went in the gate while I dumped a bucket full of feed to distract the mother cows. Sometimes cows get pretty protective of their babies and will even attack people working on them. Luckily, ours rushed for the feed and paid no attention while David grabbed Ninja, the biggest calf and shoved him against the fence so Will could slip the elastic band on him. (The tight band cuts off the circulation and after awhile the entire scrotum dries up and falls away.) The calves don’t seem to notice it. It was easier when David was able to shove Ninja up against the corral fence. With one down, they had to catch the smaller calf, Midnight. He was pretty frisky but they cornered him near a snowbank and David grabbed one hind leg. He jumped around, but David held on and then got a better hold on him so Will could come up behind. In the process, David ended up with a big splotch of wet manure on his clean pant leg. Oops! But, like they say, “S*@t happens.” Luckily, David had a clean pair of jeans in the house so he was quickly clean and the job was finished. Thank you David! Oops! Is that a patch of wet manure on David’s pant leg? Ashley bought us several baby pullet chicks and they are raising them in their bedroom. After losing all but one of our chickens, we do need to restock our coop. They are Americaunas, Barred Rocks, Buff Orpingtons, and Silver-Laced Wyandottes. I can’t wait until they feather out and can be in the coop. Our first tomatoes are up. 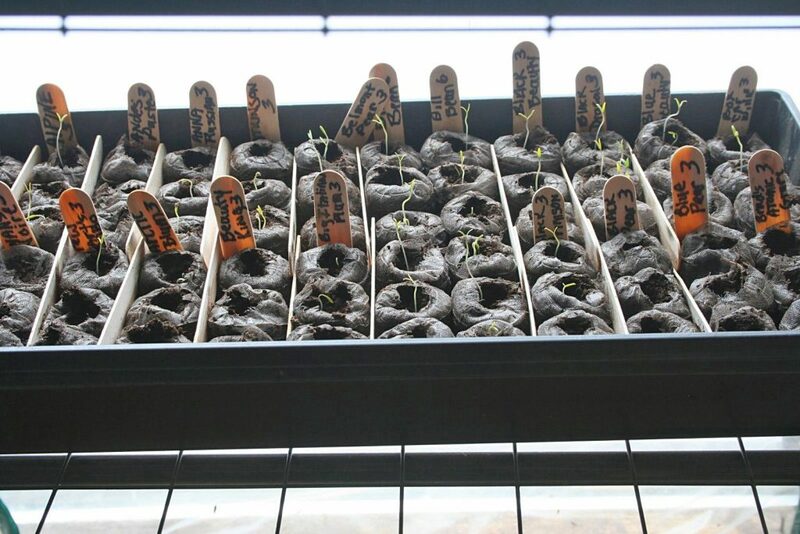 I planted an entire flat of peat pelleted tomato seeds, only three or so of each variety. And that was just the A’s through early B varieties. Whew, I’ve got to get busy to get through the whole alphabet! (If you’d like to learn more about raising tomatoes, check out my article in Issue 141 of Backwoods Home Magazine or the Twenty-third Year Anthology.) The “fried” pepper seedlings vary from very dead to pretty nice. I did replant several varieties though. Will got the driveway plowed free of “iceburgs,” but the tire he’d mounted turned out to have a sidewall leak he couldn’t fix. So today he found another tire and changed it for the now-flat one. Without a tire-changing machine it’s kind of a tough job, but he got her done. Awww, Judy. That’s so nice. Very glad that you have such great kids to give you two a helping hand! You’ve done well raising them! Happy to see those little tomato starts! I’m so grateful, too. It’s so much fun when we all work together. ‘sissy’ sleeves the vets use nowadays. It happens, and it can be washed off. All is right with the world. David is so used to having poop on him. One spot was nothing but a laughing matter. Yep, cow smells way better…. Glad u all are able to work outside! Here in Iowa we have had severe flooding,but things are slowly getting better with sun out. Many people were evacuated a few towns over. Your tomatoes look like my hubbies last year in the basement! How I miss that, wish he was here this year to plant again! It’s still pretty darned sloppy outside but warm and sunny. I’m so sorry folks south of us got so much flooding. I hope all are okay after it. I know how much you miss your husband. Hang in there and get out in the sun. Plant something and you’ll feel better.